Orbit Earth Expo Visits Hawthorne Elementary! 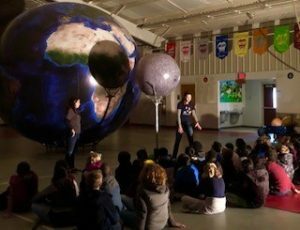 ATLANTA, GEORGIA – Orbit Earth Expo paid a visit to the K-5th graders at Hawthorne Elementary in Dekalb County on Monday. From the moment Ginny and Stephanie heard the students’ creed recited on the morning announcements, those kids were ready to learn! 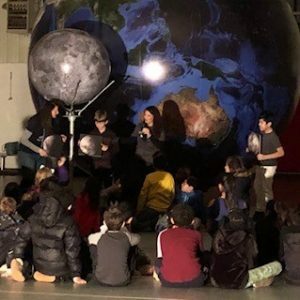 Grades 3-5 visited the 14′ earth model, “Orb” in the morning, defining rotation and orbit, identifying eclipses, and learning about limitations of models – who knew they don’t get everything right? There were some fantastic questions asked – is the Nile River really the longest river in the world anymore? (This is a great debate among scientists – read more about the debate here: Longest River Debate) Did you know that Mars is in the Goldilocks Zone like our earth? Yes! And so is Venus, but they aren’t habitable like our planet. Such great thinking, 4th grade! Look at that solar eclipse! After the shock of seeing how tiny our earth is in comparison to our sun, the 3rd grade got to thinking…if all the stars in the universe joined together, would they be bigger than our sun? Are there other stars out there that are a sun to planets like ours? How could we find them? This article is a great place to start if you would like to learn more: What’s an Exoplanet? The afternoon was for grades K-2. Students had a blast attempting to act out some patterns in our solar system! The moon goes around the earth, we all know, but at the same time, the earth is orbiting the sun…try acting that out without getting dizzy! Rotating the huge earth model in front of the sun’s light led a kindergarten student to share, “Hey wait! That means it’s dark in China right now!” That’s right! The rotation of the earth creates day and night in a repeating pattern around the world. Brilliant! What phases of the moon are shown on those cards? It was great to see Principal Limoncelli stop by to visit Orb. Your students did an amazing job with Orbit Earth Expo! Thanks for a great day, Hawthorne – SparkPoint loves coming to your school!